HCG (Gonadotropin) is not an anabolic / androgenic steroid but a natural hormone protein that develops in the placenta of a pregnant woman. HCG is formed in the placenta immediately after implantation. It has luteinizing features because it is quite similar to luteinizing hormone LH in the anterior lobe of the pituitary gland. During the first 6-8 weeks of pregnancy the HCG formation allows the continuation of the production of estrogen and gestagens in the corpus luteum (yellow corpi). Later, the placenta itself produces these two hormones. HCG is often used in combination with anabolic / androgenic steroids during or after treatment. As mentioned, oral and injectable steroids cause a negative reaction after a certain level and duration of use. A signal is sent to the testicular hypothalamic-pituitary axis, since the steroids give the hypothalamus an erroneous signal. The hypothalamus, in turn, signals the pituitary gland to reduce or stop the production of FSH (follicle stimulating hormone) and LH. Thus, testosterone production decreases because testosterone-production of Leydig cells in the testes, due to decreased LH, are no longer sufficiently stimulated. Since the body usually needs a certain amount of time to get its testosterone production going again, the athlete, after stopping the steroid compounds, experiences them in a difficult transition phase that often goes hand in hand with a considerable loss of strength and muscle mass. 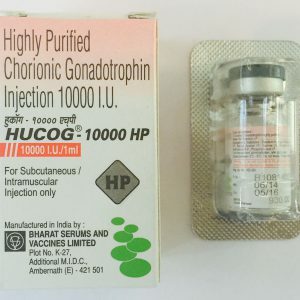 The administration of Gonadotrophine directly after the steroids treatment helps reduce this condition because HCG increases testosterone production in the testes very quickly and reliably. 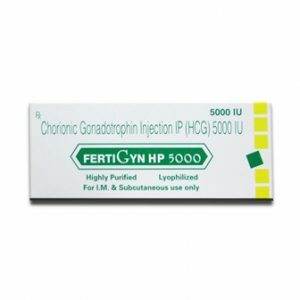 In the case of testicular atrophy caused by megadoses and very long periods of use, Gonadotropin also makes it possible to quickly return the testes back to their original state (size). Since occasional Gonadotropin injections when taking steroids can prevent testicular atrophy, many athletes use HCG for two to three weeks in the middle of their steroid treatment. It is often observed that during this time the athlete is making his best progress in relation to gains in strength and muscle mass. The reasons for this are clear. On the one hand, by taking the athlete's own HCG level of testosterone jumps immediately and, on the other hand, a large concentration of anabolic substances in the blood is induced by steroids. Many bodybuilders, weightlifters and weightlifters report a drop in libido at the end of a tough workout cycle, immediately before or after a competition, and especially towards the end of a steroid treatment. Athletes who have often taken steroids in the past generally accept this fact as they know it is a temporary condition. Those, however, who are on the juice all year round, who might be suffering psychological consequences, or who might be at risk of breaking a relationship because of this must consider this inconvenience when taking the HCG at regular intervals. A decrease in libido and spermatogenesis due to steroids in most cases can be cured by treatment with Gonadotropin. Most athletes, however, use HCG at the end of a treatment to avoid a "crash," that is, to ensure the best possible transition in "natural training." One condition, however, is that taking steroids or dosage will be reduced gradually and evenly before taking Gonadotropin. Although HCG causes a rapid and significant increase in the endogenous plasma level of the level, it is unfortunately not a perfect remedy to avoid the loss of strength and mass at the end of steroid treatment. The athlete does not experience a delay in readjustment, as it has often been observed. Although Gonadotrophine do not stimulate the production of endogenous testosterone, it does not help to restore the normal axis hypothalamo-pituitary testicles of the axis. The hypothalamus and pituitary are still in a refractory state after prolonged use of steroids, and stay that way while HCG is used, because endogenous testosterone produced as a result of exogenous gonadotropin suppresses endogenous production of LH . Once HCG is interrupted, the athlete must still go through a period of readjustment. It's simply delayed by gonadotropin use. For this reason, experienced athletes often take Clomid and Clenbuterol following HCG intake or they immediately start another steroid treatment. Some take Gonadotropin simply to get out of the "steroids" for at least two to three weeks. Many bodybuilders, unfortunately, are still of the opinion that HCG helps to become more difficult when preparing for a competition by breaking down subcutaneous fat, so that indentation and vascularization are better exposed. 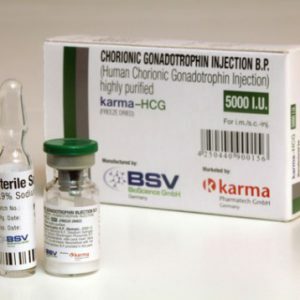 The Gonadotropin record clearly states that HCG has no known effect on the mobilization of fat, appetite or feeling of hunger, or the distribution of body fat. Gonadotropin has not been shown to be effective as an adjunctive therapy in the treatment of obesity; it does not increase fat loss beyond that which results from calorie restriction. The athlete must inject 5000 IU every 5 days. Since the level of testosterone, as explained, is considerably elevated for several days, it is useless to inject HCG more than once every 5 days. The relative dose is at the discretion of the athlete and should be determined according to the duration of his previous steroid intake and the strength of the various steroid compounds. Athletes who take steroids for more than three months and athletes who primarily use androgenic steroids very much like Androlic, Sustanon 250, Cypionate, Dianabol etc. should take a relatively high dose. The effective dose for athletes is usually 2000-5000 IU by injection and should, as already mentioned, be injected every 5 day. Gonadotropin should be taken for up to 4 weeks. 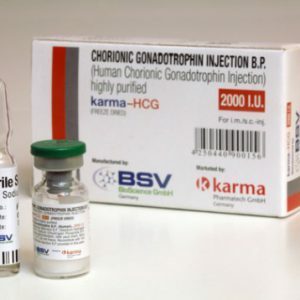 If HCG is taken by male athletes for many weeks and at high doses, it is possible that the testes do not respond well to a later intake gonadotropin and a release of the LH clean body. This could result in inadequate permanent gonadal function. On Cure's HCG should be maintained at approximately 3 weeks at a time with a cycle of at least one month in between. For example, Gonadotropin may be used for 2 or 3 weeks in the middle of a cycle, and for 2 or 3 weeks at the end of a cycle. 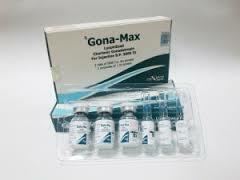 It has been speculated that prolonged use of HCG could definitely, suppress the body's own production of gonadotropins. That's why short cycles are the best way to go.